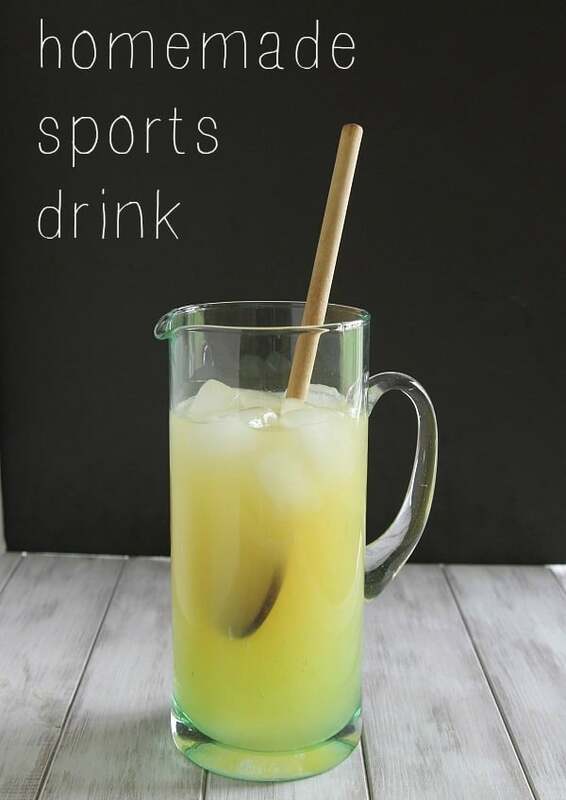 Forget the artificial brand sports drinks, you can make your own homemade sports drink with just simple five ingredients. Three weeks from today we’ll be on a plane headed to Vegas. Not to live it up on the strip though but rather, to spend a week hopping between national parks with my brother and sister in law. They basically convinced me to take a week off to exercise. So far we have hiking, hiking, hiking, maybe some white water rafting, hiking, hiking and oh, did I mention hiking planned. In June. I’ve been to Arizona in August, I’m hoping the heat won’t be as ridiculous as that was but I’m planning on hot, sweaty and tired being the motto for this trip. When it comes to sports drinks, I used to be a non-believer. Ice water was the only thing you’d find in my thermos every day on the soccer field (or maybe it was just that my parents never bought Gatorade for us) but after a few dizzy dehydration spells during summer workouts in the past few years, I’m a convert. I’ve bought my fair share of Gatorade, but 1. it’s so much cheaper to make your own and 2. why ingest the artificial stuff when you don’t have to? On this trip I know two things: it’s going to be hot and I’m going to want a cold sports drink to keep up with the million miles my brother and sister in law have planned to cover on foot. The sports drink part is simple: 5 ingredients, 1 of which is optional and 1 of which is water. My plan is to bring salt and calcium magnesium powder with me and hit up a grocery store once we land for a bottle of juice. I can make my own drink each morning in the hotel. The cold part is where this Zojirushi vacuum bottle. 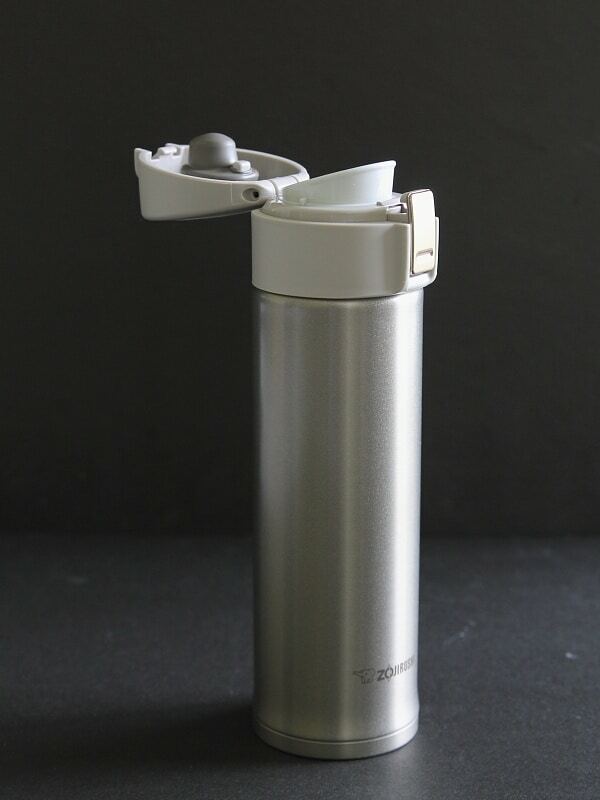 It keeps liquids cold or hot for several hours at a time and is perfect for something like hiking where you’re going to be outside the whole day. I took it for a test run at home since I have water with me at all times during the day and was seriously impressed when at 3pm, my water from the morning was still cold. I’m thinking we’re going to be bff in a few weeks. Zojirushi is also giving away a vacuum bottle to a winner. Use the widget below to enter. What would you use your vacuum mug for? 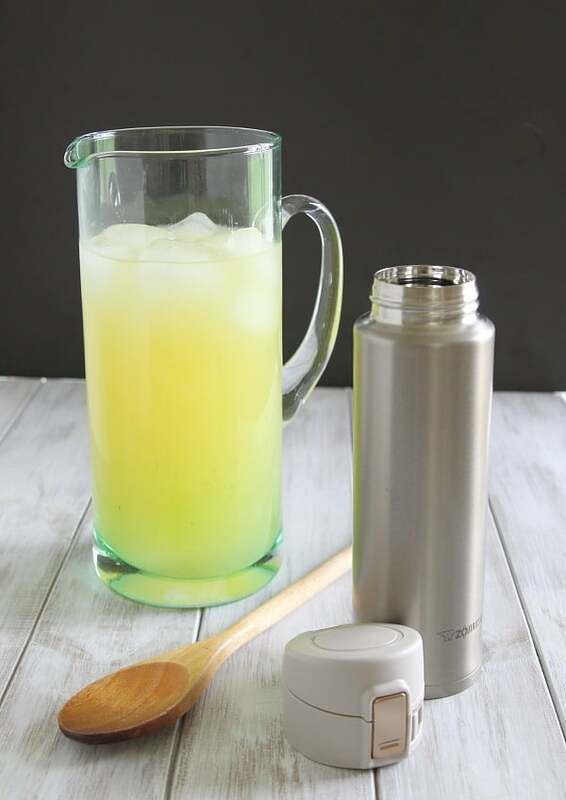 Mix all ingredients together in a pitcher with ice and stir until the salt is dissolved. This is a sponsored conversation written by me on behalf of Zojirushi. The opinions and text are all mine. What do you use for calcium magnesium powder? Having a hard time finding it in stores here. There’s a link to the powder that I use in the recipe section of the post. It’s Natural Calm brand. I do skateboarding for a long time. I always feel thirsty after skateboarding. Thanks for giving me a mind-blowing idea of that homemade sports drink. Many many thanks.